When you're trying to decide what to make for breakfast or dinner, it's nice to have recipes you can turn to that are natural crowd pleasers. With 9 Easy Slow Cooker Tater Tot Casseroles, you'll find all the tater tot casserole recipes you need to make a great meal. No matter night, cheesy tater tot casseroles and ground beef tater tot casseroles are always winners with kids and adults alike. These hearty dinner (and breakfast) casseroles are here to help make meal time easy and budget friendly. When you make slow cooker casseroles, you know you're going to have a great meal waiting for you at the end of the day, or first thing when you wake up in the morning. The great thing about tater tot casseroles is how easy they are to make, how filling and delicious they are to eat, and how much money you can save when you make them. You can easily freeze tater tot breakfast casseroles and dinner casseroles and serve them throughout the week. Ground beef tater tot casseroles like our Make-Ahead Cheesy Beef Tater Tot Casserole (recipe below) make prepping for dinner super easy. Your family will appreciate the hot meal, and since you can leave it to cook while your out during the day or overnight, this becomes a very "quick" and easy tater tot casserole recipe when meal time rolls around. Slow cooker casseroles are a busy mom (or dad's) saving grace, so take these recipes and save them for those days when you just don't have the time to think about prepping and preparing food. 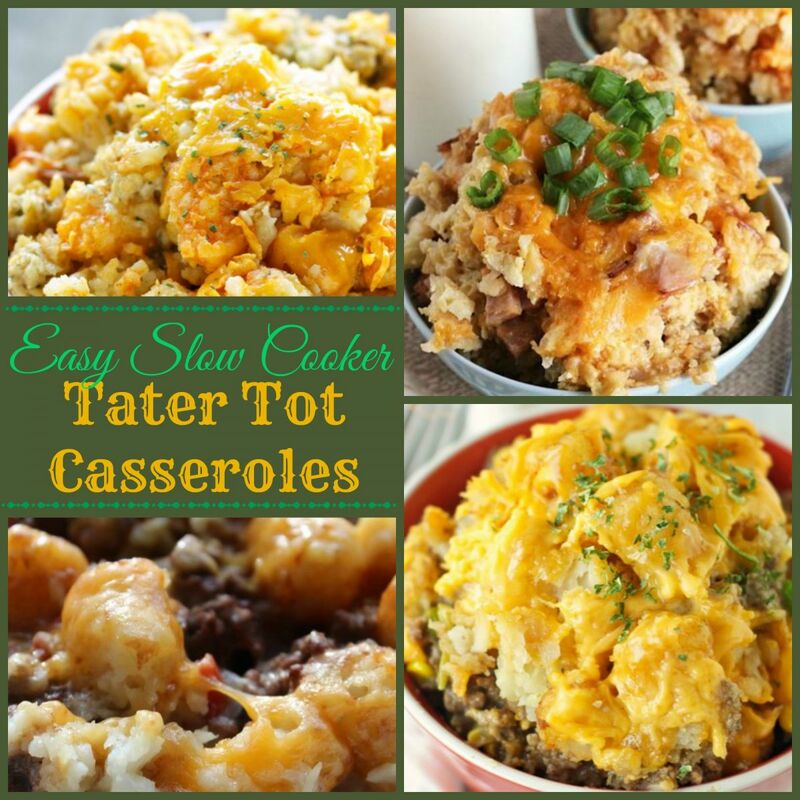 Our collection, 9 Easy Slow Cooker Tater Tot Casseroles is here to make your life easier! When you need meal inspiration, our free eCookbook, "17 Slow Cooker Casserole Recipes Classics" has great ideas perfect for any occasion. This Buffalo Chicken Tater Tot Casserole is one of those quick and easy tater tot casserole recipes that your kids will love. Try this slow cooker buffalo chicken casserole recipe on those busy days when you need a meal in a hurry. This casserole stays moist and cheesy with help from olive oil, buttermilk, and shredded Cheddar cheese, and is so flavorful! This slow cooker breakfast casserole is sure to hit the spot first thing in the morning, no matter the day. This cheesy tater tot casserole is make with two kinds of cheese -- Parmesan and Cheddar, onions, Canadian bacon and of course, eggs and taters. For many more easy slow cooker recipes, try our collection, Best of the Best in 2014: Our top 100 Recipes of the Year.